The Chinese leadership appears to be taking a pause in its anticorruption crusade. That's actually strong language, indicating that not every party cadre has been paying attention to what was decided sometime last year, most probably during the annual summer meetings in Beidaihe and secured during the plenary meeting in the autumn: That the anticorruption campaign, while essential, is to be gradually given lower priority. Reprisals for transgressions will become secondary to the rank-and-file recommitting themselves to the Party and its mission. The campaign won't be shut down, but perhaps left to lose momentum. There are already clearer signs in recent months that the anticorruption campaign has been stumbling, instead of just making some people here unhappy. (There have always been complaints from local officials privately about being told by Beijing to stop doing X, without being assured that Y or Z would be acceptable.) Inspectors have had to return to some provinces to reiterate to local officials that they have a responsibility to keep on combatting graft at the grassroots. (Some places might be beyond repair, and because their economic prospects are so lousy, inspectors have simply given up.) Just last week, a ministry head and member of China’s State Council was demoted for “poor political performance” [履责不力], specifically because of “grave dereliction of duty, the failure to root out systemic corruption” [严重失职失责，所辖单位发生系统性腐败问题]—terms that are meant to convey to cadres that the crusade isn’t a cure-all, that high-level officials have to lend a hand to keep their jobs. And in recent days, State media has called attention to problems of corruption within the inspection teams themselves, asking, “How can one supervise the supervisors?” There’s been a decline in court prosecutions of party cadres accused of malfeasance (instead of cases being pursued within the party ranks) —a sign that using existing laws to combat official corruption hasn’t worked all that well. And some high-profiles cases have simply (and suddenly) been dropped in recent weeks. So instead of doubling down on the crackdown, Beijing seems to think that it should stand pat in the anticorruption crusade, at least for the time being. In other words, “the work of anticorruption” will be reorganized and pursued differently in these three regions, to see if there are better ways to do that work. Retribution is being revisited; reform within reform--modifying the anti-graft effort--is to be the focus. Xi and his allies are reminding cadres that they really need to watch themselves in a different way, instead of waiting for the next time a central inspection team swings through town, or hoping it will all be soon over. “Self-discipline” [自律]—as in Xi’s admonition in the speech above that “leading cadres, especially senior cadres, must strengthen self-discipline” [領導幹部特別是高級幹部必須加強自律]--is being emphasized. That warning has popped up at various times, but it has taken center-stage recently, especially in the commentaries published to supplement Xi’s statements. It’s a sharp signal to the Party rank-and-file (and to government officials generally) that there’s going to be more emphasis on ideological instruction, rather than prosecution. And it’s part of Xi’s push to make sure that the Party, as he notes, is a political organization with a historical mission, not a place to pursue personal connections and profit. Talk about politics, Xi urges, for it’s “the fundamental guarantee for our party to build calcium and strengthen the body and keep fit and healthy.” [讲政治，是我们党补钙壮骨、强身健体的根本保证]. At the same time, party commentators have been at pains to assure officials that all this discussion of politics being the foundation of the Communist party isn’t the start of purges, that there’s no resemblance between campaigning to make the Communist party a more political party and the Cultural Revolution [讲政治不是老调重弹，更不是“文革”中搞的极左政治，而是有很强的现实针对性]. Clearly, some in the ranks have expressed anxiety about that prospect. 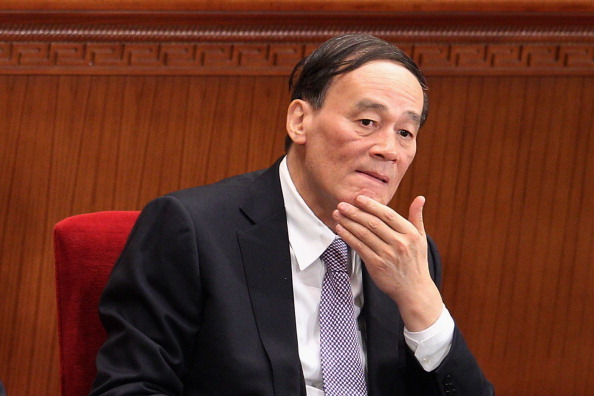 Still, if you’re Wang Qishan and his disciples and you’ve been running the Central Commission for Discipline Inspection under Xi, and the mission of your position has been brought into question, you have to wonder just what sort of future you’re facing. Perhaps this pause is just an interregnum, simply an intermission before this year’s Party Congress, and the campaign will move into the next act. Or maybe it’s also the sign that the show is coming to an end for some.